With small children you're never alone. They're always there. Even when you're taking a pregnancy test. 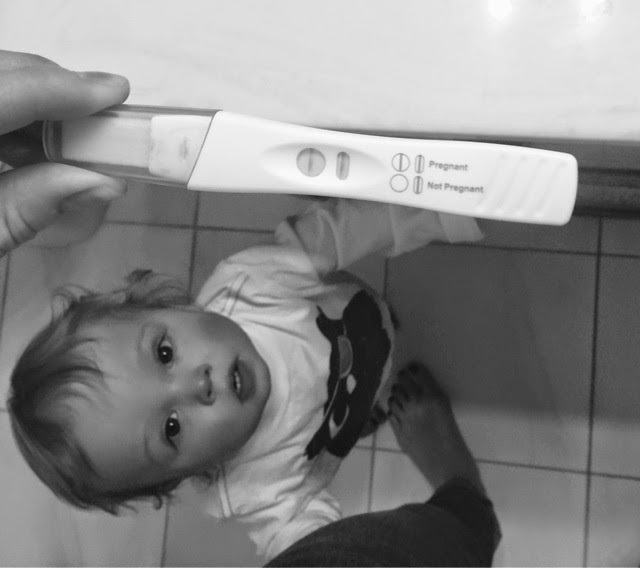 Yup, we're expecting baby #2 in September! Bryan's elated. I'm excited, nervous, and terrified. Wade is oblivious. Waaaa!!! I'm so excited for you! And this picture is priceless! Thank you! we're excited for sure - I thought the picture was perfect...although it was stagged :). At the moment I wasn't thinking about it, ha!! WOOOHOOOO! Congrats! The fun and the craziness multiplies. Mostly the fun! Thanks - definitely worried about the craziness and excited for the fun :).